Ajith Kumar, fondly called 'Thala' by his fans in Tamil Nadu is also described as the King of Opening. But this unassuming actor does not believe in such superlatives. He also does not like to talk about or promote his films, which is unusual in these times of aggressive marketing. He is guarded and cautious in his opinions. In place of the carefree, impulsive young man I met several years ago, is a 41-year-old, grey-haired, mature man who believes that living life and loving are more important than anything else in life. 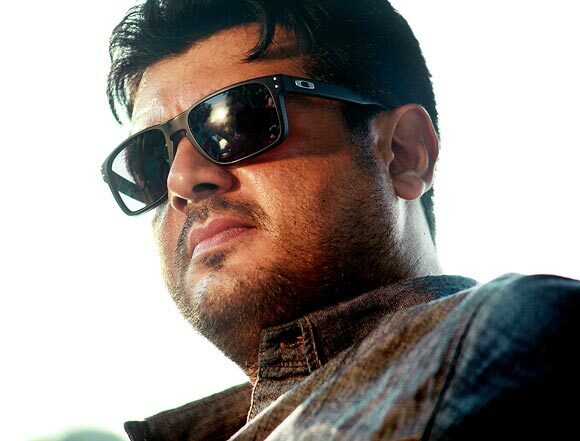 In this rare and exclusive interview, Ajith has chosen to talk more about life than films. The first time I met you was in 1995 when you were recuperating from a bike accident. What was in your mind then? Dreams? I was too young to comprehend what was happening. Getting back to normality was my priority. I did not think about anything beyond that. My health was the only priority and my road to recovery took all my time. Are you not a dreamer? Aren't we all dreamers? It's only because man dreamt of flying that we are travelling in planes. Behind all inventions, we see the dreams of people. I am glad that mankind on the whole are dreamers. By the year 2000, your film career was flourishing and you had a lot of fans and fan clubs. How did you react to this sudden mass adulation? I was the first person from my family to enter films. So, everything connected with films was new to me, including fans and fan clubs. It took me some time to cope with the way the industry functions, and how it doesn't work at times. It has been a learning process for me. Yes, it took time for me to come to terms with what was happening around me. Let me put it this way: What I feel for my fans is something that cannot be described in words. All I want to say is that they are in my prayers and I wish them all very well. Did you try to analyse why so many people adore you? No, not at all. I was always focused on what was given to me. Yes, I was conscious of what was happening around me, but I tried to stay focused on my work and the responsibilities connected with my work. Did you enjoy the love and adulation of people? More than enjoying it, I looked on it as a huge responsibility. I am more conscious about not misusing the adulation. I am aware of the love they have for me, and that is why I said, I pray for them. I only tell them, look after your parents, God will look after you. I don't expect anything else from them other than their love. Nothing less, nothing more. Fans blindly follow film stars and do whatever they do. Isn't that scary? You are demeaning people by saying that. I have a lot of respect for people, and I feel they are far more sensible and responsible than to ape or imitate somebody. If at all something like that happens, it's a rare case. I don't think it is something that we need to look down upon. You surprised all when you chose to act with grey hair in Mankaatha. I don't think I did anything unusual or brave. The protagonist of the film was a politically incorrect character and the role demanded that I appear in a certain way. It is not that I wanted to do what no one else has done or anything like that. So, unlike what many people think, you were not influenced by the George Clooney look? Honestly, it just happened and it is an honour to be compared to such a huge star. As a star, are you not bothered about your physical appearance? I am not so critical about myself and my looks. Physical appearance also is linked to what you can adapt to and what you cannot. Everybody here knows about my health issues. It is said that actors are narcissists. Are you one of them? If you need an honest answer, you should ask those who worked with me and interacted with me. I can't comment on what I am. How can I answer about my own character? Being an actor does not mean that I am from Mars or any other planet. I am as normal as any other human being. I experience the same emotions as anybody else. I don't think I am any different. I am an actor by profession. It is my job and that is all. Do you try to analyse your film career or yourself as an actor? I am never afraid of failure. Nobody should be scared of failure. Why I say is, failure teaches us more about life than success. Some people are scared to try new things for fear of not succeeding. They think, what if I do not succeed... That thought, I think is the biggest stumbling block one can put for one self. Life is not only about what you achieve but about what you learn in the process. You may have achieved so much in life but may not have learnt anything. Happiness is to be content with what we have and accept what is given to you by life. Contentment is the first sign of happiness. There is a time for everything in life. The root problem behind unhappiness is when you constantly want to accumulate, accumulate and accumulate. There has to be a relation between ambition and your abilities. You try to understand your shortcomings and try to achieve something that is within your abilities and limits. Most importantly, you need to be aware of what your abilities are. Of course, what I was ambitious about at 20 is totally different from what I want today. After 40, you start looking at life differently. At 41, you feel life is not just about ambitions; it is much more than that. It is all about experiences. That is how I look at life now. My ambition is to sustain what I have achieved till the end and inculcate it in my child. Photography is something I took up in 12 years back. I started from the basics. I do not start using a gadget until I read the entire manual. You could call it OCD (obsessive compulsive disorder) or something like that. Are aero-modelling, photography etc your passions? I am thankful to God that I have been able to experience so many things. I feel privileged to have experienced so many emotions at different times. God forbid, if I were told tomorrow, 'Ajith, your time is up now', I wouldn't bat an eyelid. I wouldn't complain. I would quietly go! Are you bothered about the outcome of your films, like how commercially successful they are? I am eager to know the reviews and reactions. I am as eager as my audience is. There is a very good saying, 'this too shall pass'. Those who are going through bad times can think this too shall pass. And those who are going through good times also should remember that this too shall pass. This will keep you sane and grounded. Don't you care about the commercial success of your films? "Don't care" is too harsh. I am concerned about everything that I do in life, be it films, or photography, or motor racing, or aero modelling. Why do you then not market your films like other actors do? I don't like comparisons. I am comfortable with what I am doing and others are comfortable with what they are doing. So, you are not comfortable with marketing your films? A good film is a promotion by itself. These are my personal views and I convey this to my producers and concerned people when I sign a film. I tell them my comfort level and only after that, I sign a film. What is the most important thing for you to accept a film? Compatibility is my main prerogative in signing a film. There has to be compatibility between the producer, director and myself. If we cannot vibe with each other for five minutes, we will not be able to work together for months. Do you plan what you want to do in life, like your film career? At 41, I believe more in looking at the present than looking behind or ahead. I live for the moment. For example, right now, there is nothing in my mind except this interview. Similarly, when I am acting in a film, I live that moment. I believe there is so much fighting and violence in this world because mankind believes that it is going to live forever. But we don't know what is there for us tomorrow. So, why don't we forget all the enmity and live this moment and not step on anyone's toes? I have seen some of my friends who were terminally ill appreciate life and live a better quality of life. They were so content with their life and so much more concerned about people. It is from them that I learnt this lesson. I just want to live for the moment because we are not going to last forever. Acting in films or films becoming hits or making money are not important in front of living a contented life where all of us love each other. VOTE! Like Sonam Kapoor's Cannes Appearances? When Priyanka Did a Mumtaz, Deepika Did a Sridevi!